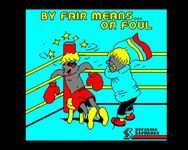 By Fair Means or Foul... is a fairly early boxing game, but one in which you can cheat! The format is basic - the fights just get more difficult as the game progresses. The thing that sets this game apart is the cheating - you can headbutt your opponent, and kick him in the groin. Fun!